As part of the Vice President’s National Cancer Moonshot Initiative, the National Cancer Institute has launched an online engagement platform to enable the research community and the public to submit cancer research ideas to a Blue Ribbon Panel of scientific experts. Any member of the public is encouraged to submit his or her ideas for reducing the incidence of cancer and developing better ways to prevent, treat, and cure all types of cancer. The ideas that are submitted will be discussed and considered by the proposed working groups and the Blue Ribbon Panel as they deliberate about top cancer research priorities and opportunities that should be part of the Cancer Moonshot. The panel will report its findings to the National Cancer Advisory Board later this summer. 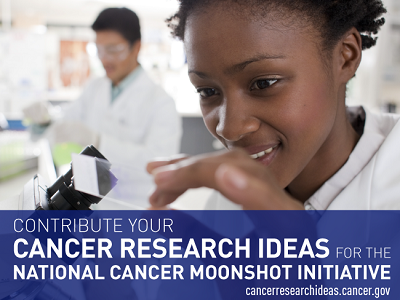 To submit your scientific research ideas to the Moonshot Initiative visit: https://CancerResearchIdeas.cancer.